Home OPINION If Kenya burns, we will blame the media. 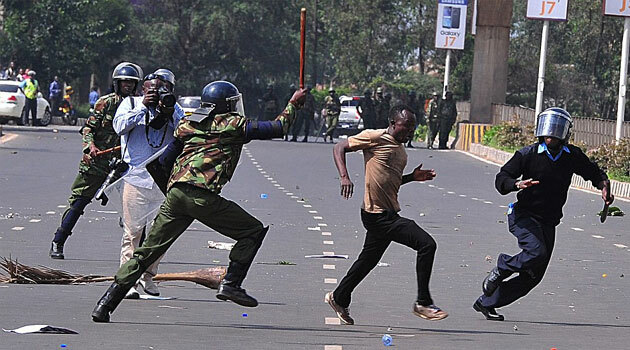 A demonstrator being cornered by the police during a previous Anti-IEBC demos in Nairobi. The media is the watchdog of the society because of the important role that it plays in protecting the public against the excesses of the ruling elite and in holding governments accountable. However, media professionalism involves responsibility, which includes reporting with accuracy, fairness, without distortion of information and selection of truly important news for the people. The media plays a key role in shaping how society operates by articulating ideas and influencing perceptions and attitudes. This simply means that it should cultivate the proper balance between self and collective interests which, sustained by the interaction with the community, is important for social order. Thus, the media at all times should adhere to very high professional standards and uphold neutrality, only taking a stance in public interest, not parochial interests. Kenya currently is at its most sensitive moment where a slight mistake can light a fire that will be very difficult to extinguish. In recent times, the media has been various complaints against the media over professional standards. There has been numerous cases where the media has been accused of distortion of facts by placing improper emphasis of one aspect of a story, by reporting the facts out of the context or by suppressing relevant available facts, amounting to ethical violations by the media. The media is expected to report inflammatory political speech in a manner that is both accurate and least likely to provoke violence. Unfortunately, the Kenyan mainstream media has of late been completely out of hand inciting violence through their irresponsible journalism. The kind of content shown on the screen these days are inflammatory, hate-inciting and aimed at polarising the nation. Though we fought to protect free speech, acts that might incite violence are not free speech. The modus operandi and design exhibited by the media today is reminiscent of the 2007-8 post-election violence in which more than a thousand people were killed on the basis of false propaganda spread via the media. Personally, I am deeply saddened by the growing degradation of the so-called ‘mainstream’ media. For quite some time now, there has been an increase in strident and extremist tone of ‘reporting’ and acceptance of ‘opinion’ voices which seek to attack and disparage our fellow Kenyans. It is a sad state of affairs that the media is being used too often to openly incite acts of violence against fellow Kenyans in the guise of ‘freedom of the press’. There has been a broad series of praise for public criminal violence in the media and more cagey publications phrasing as if such violence ‘was ok’ just because they were perpetrated by people ‘friendly’ to the media stations concerned. The mainstream media has been used to glamorise, incite and wink at criminal violence as somehow ‘justified’ and ‘right’ because the media writers and their editors do not agree with a certain political wing’s views. Political inclinations, obsession with economic returns and tribalism are key issues degrading media practice in Kenya. The country is sharply divided by the two main political outfits, Jubilee Party and NASA, and the media has not been in any way different. Their opinions on various issues especially concerning the three Arms of Government (the Executive, Legislature and Judiciary) and constitutional bodies like the Independent Electoral & Boundaries Commission (IEBC) have been so biased depending on the side of political divide their editorial policies prescribe to. This has dictated the kind of news items and political analysts they present on their platforms and it does not require rocket science to identify which side of political divide each media house secretly supports. It is also an open secret that media houses do ‘sell’ headlines and prime airtime to the highest bidder. Thus, the media sees nothing wrong with certain public incitement and praise of criminal violence and will use their might and vast media reach to castigate or silence other sources that expose this vice. It is in the same vein that the media will hype ‘police brutality’ but turn a blind eye on the criminal elements engaging in the violence and crime that attracted the police action in the first place. The media treats what these ‘criminals’ say as the gospel truth but blacklists anything that comes out of the police as outright lies and defense for abuse of authority. The media too glorifies lawlessness and violence via social media through proxy blogs which they use to say what they themselves are unable to due to the laid down legal checks and balances manning their profession. NB: All mainstream media houses in Kenya run separate blogs away from their mainstream sites. In a nutshell, lack of media professionalism is one of the greatest challenges facing this country. The role of journalists has been challenged by the social media which has become the key source of information for most people even though what is put on social media is mostly rubbish. In the fight to retain their relevance, the mainstream media and most journalists have ended up playing ball. However, journalists have to continue to be journalists and should conduct their activities according to high standards of ethics, accountability, legality and credibility, while exercising rights such as freedom of expression and information. Ethical values are crucial in the way journalists shape content, hence the need to examine them critically in journalism practice.